If you’ve ever made a web site and wanted it to look consistent from one browser to the next, then you’re well away of the difficulties that are involved. Fixing these sorts of styling issues can be a major annoyance, however, I like to hunt down issues on my own pages from time to time and stand up to the challenge. One issue that I can across today was dealing with horizontal menu positioning using unordered lists (<UL>) and some positioning. The positioning wasn’t consistent between browsers or even operating systems. Being fairly new to Mac OS X, I was excited to install Opera and see how it compares to the default browser Safari as well as others such as Firefox and Google Chrome in terms usability and appearance. I was happy to find that Opera seems to have the most natural feeling user interface when compared to Firefox and Google Chrome, using Safari as the standard since most die-hard Mac users are likely familiar with it the most. While I didn’t capture Safari in a view where the tabs are visible, the image above is a decent comparison of the browsers’ default address bars and navigation buttons. As you can see, the buttons, address box and search box in Opera mimic those found in Safari quite well and are not much of a change at all for any ex-Safari user. 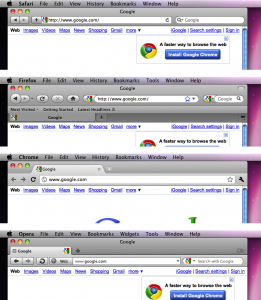 The tabs used in Opera are also very similar to those found in Safari (pictured below), with the most significant exception being that they are flipped vertically and placed above the address bar (in Opera) rather than below (like in Safari). While some people may prefer Firefox or Google Chrome over both Opera and Safari, the point remains that their designs are inconsistent with the overall look and feel of the OS in general. That’s not to say that Opera doesn’t have some inconsistencies of its own. There are a few of them, but most of what I’ve found are minor detail tweaks that are needed to perfect the skin. Just to mention a few things that are stand out to me, the “New tab” icon size should be decreased slightly, retaining the Opera style while removing the unnecessary bold touch. If you compare this button to the same button found in Safari you’ll notice that Opera’s approach is a bit too bold and that changing this makes it more elegant looking (in my opinion of course). The borders for the navigation buttons, address box and search box should all be slightly adjusted to match the colors used for these in Safari. There are slight inconsistencies among these, with disabled button borders being darker than enabled button borders. Another inconsistency with Opera is that text boxes in the address bar are not highlighted with a blue glowing border when they are focused…as they are in Safari, Firefox and Google Chrome. Its difficult for me to see if this is advantageous or simply an oversight, however, the “pro-integration” side of me certainly thinks this should be fixed to match the behavior of other browsers in OS X. Various icons throughout the user interface need to be desaturated to remove color for consistency. An example of this can be found in the address box with the drop down icon. If you look close, the drop down icon is actually blue whereas other similar icons, like the drop down icon in the search box, are gray scaled. This is also a bug I’ve seen in the Windows and Linux skins, but the OS that demands attention to detail is likely the one that this is most noticeable on. The Speed Dial page, though it was “invented” before the other spin-offs, now uses a darker background that makes it feel a bit more familiar to Safari’s implementation. I find this to add to the integration effect, whereas previous Speed Dial background images felt out of place. On the other hand, Opera doesn’t boast comparatively appealing 3D thumbnails or features to those found in Safari. Instead, the Opera Speed Dial packs in a redundant search box and no immediate method of searching through your history (visually at that!) or displaying your top visited sites automatically. With a default Speed Dial tab open, knowingly or not, you’re looking at three different ways of searching the Internet…all with the same available list of search engines. You can search from the address bar by simply prepending your search terms with a specific search engine “keyword”, from the dedicated search box in the address box or from the additional search box in the Speed Dial. If I had any influence on this design, I would remove both dedicated search boxes and make the address box smarter and more visually suggestive of performing a search when it is in use. While I’m suggesting changes to the Speed Dial tab, why not take advantage of Opera’s ability to generate thumbnails of pages to give the user a visual of the pages they are searching through just like Safari is capable of? With the ability to generate these thumbnails already, there is no reason why Opera shouldn’t implement a similarly more appealing visual search of previously visited sites. 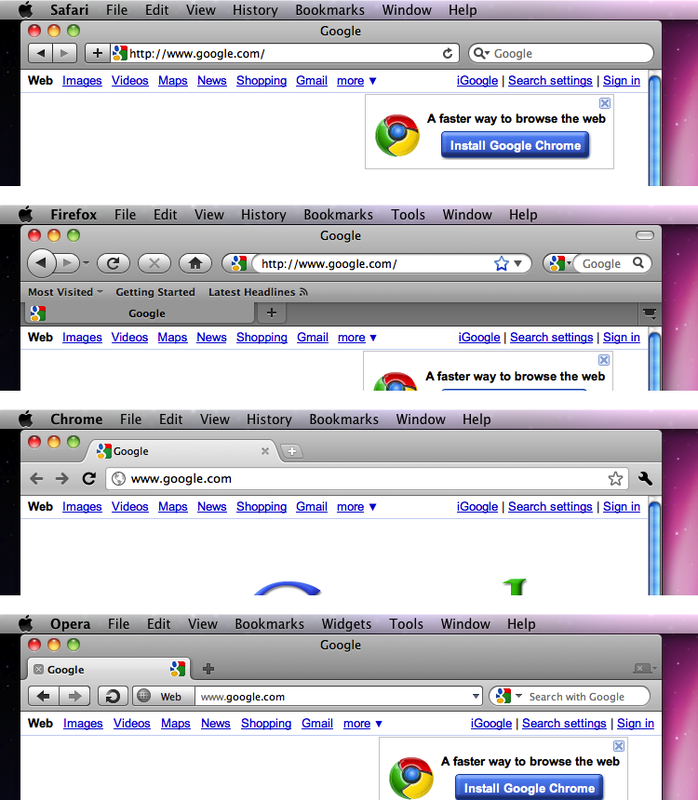 As I said before, all browsers have their problems with UI design and integration, especially in Mac OS X. Of the available browsers for this platform, the one with the most features and the best OS X integration is far and away Opera 11. The performance improvement isn’t bad either, with my test results showing Opera 11 beating out Safari 5.0.3 easily in the SunSpider benchmark. You can take my opinions with a grain of salt if you wish, but you should undoubtedly give Opera 11 a spin if you haven’t already! 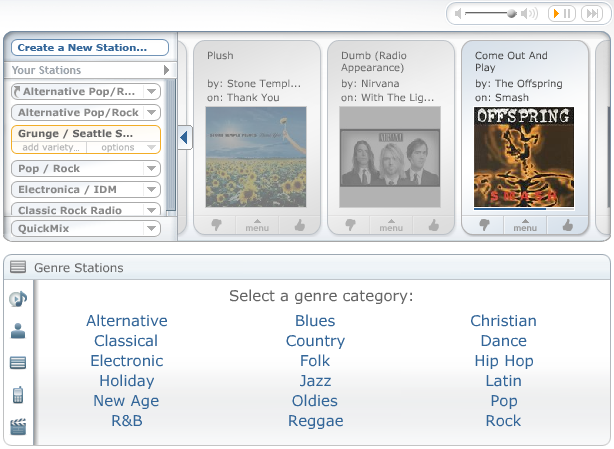 Recently I started using Pandora Internet Radio again (I hadn’t used it in ages) to stream various genres of free radio tunes online. 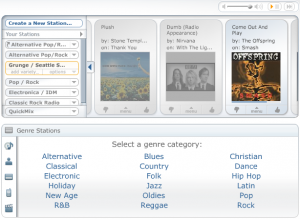 Pandora has a wide selection of genres to choose from and comes as a free and a premium service. The free service is all I’m looking for and I’m willing to wait for short advertisement breaks from time to time. If you aren’t patient enough for the short pauses in your tunes or just utterly hate advertisements then you can get the premium service for just $36 a year. This is actually a very affordable deal when you break it down to only $3 a month or just $0.75 per week, especially if you use it regularly. I’ve been using Last.fm for nearly two years now scrobbling tracks from my computer via Windows Media Player and Rhythmbox in Ubuntu. The list of audio players that now support scrobbling to Last.fm is far to long to post here, but if you find one that won’t scrobble by default then chances are someone’s written a plug-in to do just that. One plug-in, or add-on/extension rather, that I recently came across is called LastFM Firefox Extension. This is a nifty little extension that allows you to scrobble tracks from various listed services with Pandora being one of them. After installing the LastFM Firefox Extension you’ll notice that it ties in nicely with the other extension icons you may use frequently (pictured above is Firebug, Greasemonkey, LastFM Firefox Extension). You can get a quick glance at the currently playing song without ever leaving your current tab or having to scroll through tabs to find it in the tab title. Right from the icons you can Favorite or Heart the tracks you like. This will favorite them automatically on Last.fm for you rather than making you manually go to Last.fm to do this. You can also tag songs with any tags that you feel fit that specific song using the Tag icon (I personally haven’t found a good reason to use this yet, but you may know of one!). To get started with this extension, it currently comes in two flavors: Stable and Beta. I don’t typically promote Beta software, but in this case, you’re far better off using the Beta rather than testing your hit or miss luck with the current Stable. Login to your Last.fm account and join the LastFM Firefox Extension group (this is mandatory). Depending on your luck you may be forced to wait up to 24 hours before you’re granted permission to install the Beta version. It’s well worth the wait (1 day isn’t that big of a deal is it?). After joining the LastFM Firefox Extension group on Last.fm you will need to download the Beta version from the official extension page. It may ask you to verify that you are authorized. This just means you must be in the group on Last.fm and you probably need to of been in the group for 24 hours or more. Once you get the extension installed simply go to Tools -> LastFM and enter you credentials so it can scrobble your tunes! Depending on when you come across this post, LastFM Firefox Extension may or may not still be in Beta. Feel free to use the current stable version if you prefer to avoid Beta software. Enjoy scrobbling those tunes! I had to “undelete” about 300GB of data ranging from several years of irreplaceable family photos to website backups and database backups to my music collection to VHS family videos that I had been in the process of converting to DVD, etc. To say the very least, it was a horrible nightmare. I thought I had lost all of the family photos that I had been archiving for so long and even had organized by picture dates in folders and such. Well, fortunately I was able to get about 80% of the data back off of the hard drive that went bad and store it all on another hard drive that I had at the time. The other 20% was basically expendable data that I could replace or was honestly just wasting space and wasn’t worth the effort of spending more time to recover. This great extension is called Firefox Universal Uploader (fireuploader). I’ve actually used it in the past to verify that it worked as I needed it to, but I hadn’t actually used it dependently until now. It’s been around for a while and I’m sure that if you Google it you will find plenty of reviews and how-to articles. I’m well on my way to backing up all of my old photos again and even organize my new ones into the collect. For a while I had just been uploading to Flickr and didn’t really store the pictures I had taken since I knew I was going to eventually just download them all into an organized group of folders. If you have a large collection of important family photos then you should also invest in storing your photos online in places like Flickr (free 100mb/month but only the last ~200 photos are accessible..or..Unlimited Pro account for $25/year) or even just using Gmail to store them with GPhotoSpace for free. Another thing that I’m doing now is using two separate storage devices to backup my photos and other valuables and synchronize them across machines so if I lose one then I still have the other. CSS: More on Acid Testing…Acid3 Test! 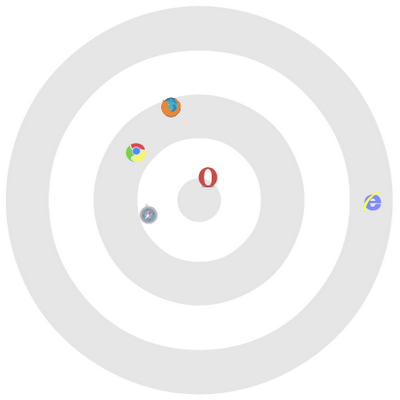 A while back I blogged a piece on Internet Explorer and Web Standards. Well, I’m back at it! Only this time I have some good news and some disappointing news. On to the on-topic content, which also contains the bad news. 😛 WebStandards.org recently officially release the Acid3 Test to the public! The test has been available all along the way (the test itself took some time to develop) and I checked it out from time to time while I was waiting, but testing an incomplete test isn’t really testing at all. It’s a neat test (not as visually cool as the Acid2 Test)! I recommend that you test your browsers with the various Acid Tests every now and then to keep track of how well they are actually doing their job and following web standards! Please let me know if you see any different results or if you have results for versions that I wasn’t able to test! Author kyleabakerPosted on January 31, 2008 April 4, 2009 Categories Firefox, Internet Explorer, Opera, Safari, Web BrowsersTags acid test, acid3, Firefox, Internet Explorer, OperaLeave a comment on CSS: More on Acid Testing…Acid3 Test!